Thor: The Dark World – Check Out This New Poster Of The Godly Ensemble! The Mighty Avenger is the next superhero up to bat from Marvel. Thor: The Dark World will be hitting theaters this November. The marketing for movie should picking up in the next month or two. What better way to kick things off then having a new poster? This new image is the second poster for the film; but instead of just featuring the god of thunder, the entire cast assembles on this new sheet. Some avid movie geeks might shake their heads at the poster because of its Photoshop traits. However, in this case, the poster is fitting for the film. The images show off the film’s scope and atmosphere; and both seem appropriate for Thor. Plus the coloring in the poster gives it a certain distinction . The Dark World continues the story of Thor after the events of The Avengers. When an ancient evil rises from the darkness, Thor must protect Asgard from the malevolent Malekith the Accursed and his dark elves. During this dangerous quest, Thor is reunited with both Jane Foster and Loki, who help the Mighty Avenger against this threat. Stay tune for more on this upcoming Marvel film. 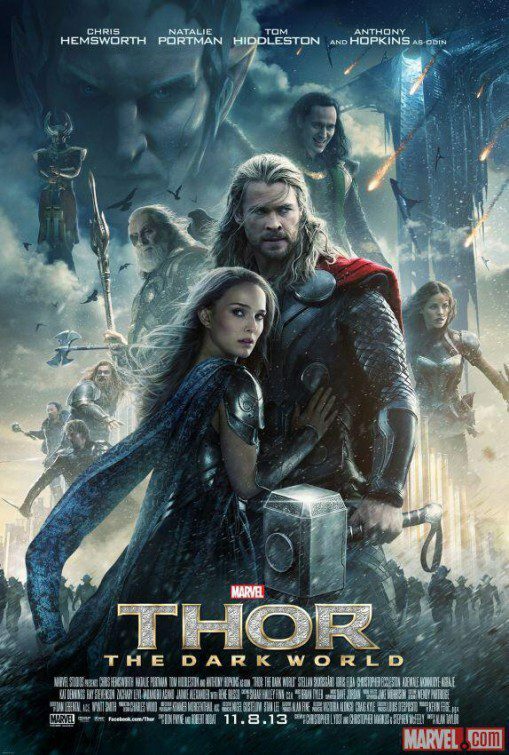 Until then, enjoy the latest poster for Thor: The Dark World. See the movie when it hits theaters November 8, and catch the new trailer next week.